WASHINGTON (CNS) — U.S. Catholic Church leaders who awoke to the news of Pope Benedict XVI’s announcement that he will retire at the end of February said they were surprised by the news but admired the pontiff’s courage and humility for making the decision. “The Holy Father brought the tender heart of a pastor, the incisive mind of a scholar and the confidence of a soul united with his God in all he did,” the cardinal said, adding: “We are sad that he will be resigning but grateful for his eight years of selfless leadership as successor of St. Peter. Cardinal Dolan was interviewed on the NBC’s “Today” show early Feb. 11 where he said he was as “startled as the rest of you” about the news. 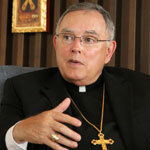 In Philadelphia, Archbishop Charles Chaput reflected on the pope’s announcement on Feb. 11. “From his work as a young theologian at Vatican II to his ministry as universal pastor of the Church, Joseph Ratzinger has served God and the global Christian community with intelligence, eloquence and extraordinary self-sacrifice,” the archbishop said. Washington Cardinal Donald W. Wuerl talked about the pope’s decision on local news radio WTOP before 8 a.m. The cardinal said he was “very much surprised” by the announcement, noting that he had seen the pope less than a month ago and there was no indication of a possible resignation. What does not surprise the cardinal, though, is that the pope was able to make such a decision. “I don’t think we should be surprised,” he said, that when the pope realized he didn’t “have the strength to continue” his role he had “the humility and courage” to act on it. In Chicago, Cardinal Francis E. George echoed his fellow U.S. prelates in saying the pontiff always has put “the will of God for the good of the church before every other consideration” and “that same resoluteness of purpose” is evident in his decision to resign. Archbishop Allen H. Vigneron of Detroit said that he, “like most of my fellow Catholics, woke up to the very surprising news” that the pope was resigning. “That is the sense we bring to this announcement. Our spiritual father has determined, by the best light given to him in prayer, that for the good of us all he must lay down his office,” he added. “This is a decision that reflects Pope Benedict’s stewardship of his office and is a sign of his deep humility,” he said. Bishops across the country issued statements, wrote blogs, tweeted and held news conferences Feb. 11 to discuss the pope’s resignation. Boston Cardinal Sean P. O’Malley recalled being with the pope when he met with survivors of clergy sexual abuse during his visit to the United States in April 2008. “At that meeting, the Holy Father’s pastoral care for the survivors was clearly evident, as was his commitment and determination to heal the wounds of all persons impacted by the abuse crisis and to insure that the Church continues to do all that is possible to provide for the protection of children,” he said. Carolyn Woo, president and CEO of Catholic Relief Services, the U.S. bishops’ overseas relief and development agency, recalled meeting the pope just a few weeks ago. Bishop Paul S. Loverde of Arlington, Va., joined many others in urging Catholics and all people of good will to pray for and support the pope “as he moves forward into a new chapter in his journey of faith” and to ask the Holy Spirit to guide the cardinals during the next conclave to elect his successor. In the remaining days of his papacy, “our thoughts and prayers are with Pope Benedict … who has worked so hard in leading the church, and has always been such a good friend to the Knights of Columbus,” Supreme Knight Carl Anderson said. He, too, urged prayers for the cardinals who will take part in the conclave. Speaking on behalf of the Catholic Press Association of the United States and Canada, president Greg Erlandson praised the pope for being a strong supporter of the Catholic media. “His past eight statements marking the World Day of Communications have been profound meditations on the role of media in the life of the church and the world,” said Erlandson, publisher of Our Sunday Visitor in Huntington, Ind. U.S. church leaders also expressed confidence that Pope Benedict’s legacy would long endure. “The witness of his life and work has borne incredible fruit and will continue to do so in his retirement. His impact on the church will be felt for generations to come,” said Denver Archbishop Samuel J. Aquila. “The church will continue to be blessed by his prayer lifted up for the needs of the world, as well as by his writings which will continue to nourish the minds, hearts and souls of Catholics around the world,” he said. Others noted the significance of the pope’s decision coming during the church’s Year of Faith. During a morning news conference, Cardinal Wuerl stressed that the pope has “called all of us to carry out the spiritual mission of the church” particularly in the Year of Faith. Pope Benedict emphasized that “each one of us is capable of a personal relationship with God. That is his message,” Cardinal Wuerl said. Contributing to this report was Mark Zimmermann, editor of the Catholic Standard, newspaper of the Washington Archdiocese.